Enjoy some classic bubble shooting action in this simplistic yet colorful, space-themed, free-to-play bubble shooter game, Bubble Planet! Play in either puzzle or arcade modes and try to complete the levels available before the UFO touches the ground. Without an energy or life system in place, you can play until you (literally) drop! So, don’t wait – give this game a try today! 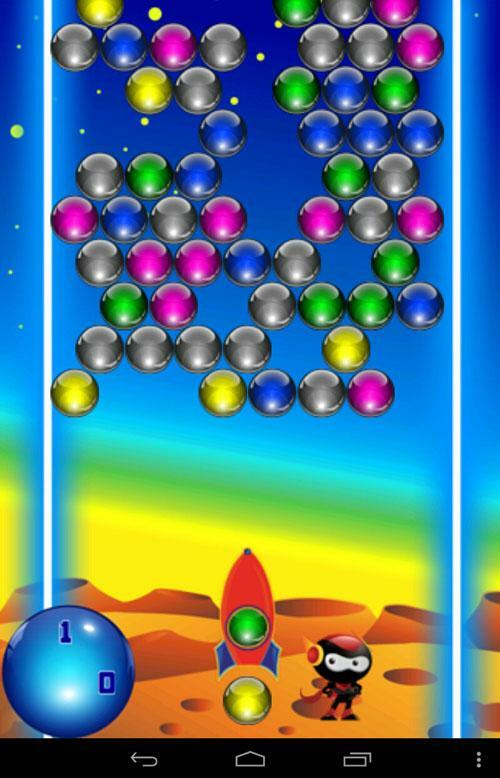 Being a classic and rather simplistic bubble shooter game, Bubble Planet has an easy-to-grasp gameplay and controls. What you’ll need to do in this game is to shoot bubbles so as to combine 3 or more bubbles of the same color to remove them from the screen. To shoot, you merely need to tap on the spot where you want to fire the bubble. You could even bounce your bubbles off the walls just so you could get in between some trickily-placed bubbles. On the downside, you aren’t allowed to switch between the bubble you have in your bubble shooter and the one next in line. Not to mention, if you’re idle for too long, the bubble shooter will automatically shoots out its current bubble, messing up your bubble layout even further. These little tweaks in the gameplay may make Bubble Planet a tad bit tougher to play, but it’s still all good provided that you’ve honed your skills well enough over the years! 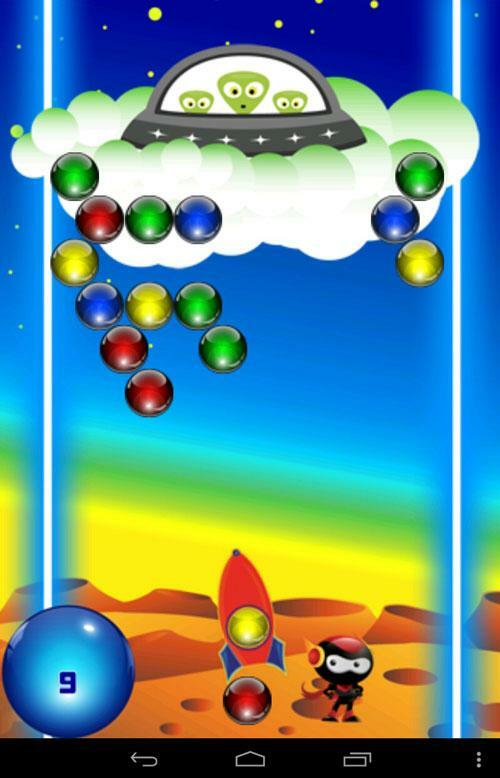 Your main objective in the game is to clear all the bubbles up in order to proceed to the next level. Furthermore, each game you play in Bubble Planet is timed (in some sense). This is because the UFO that is located at the top of the screen will descend after some time, bringing any bubbles that are glued at its underbelly down along with it. There isn’t any timer to show you how much time you have left, so you’ll just need to try to complete the levels as fast as you can! Need some help with a level? Fear not! Although Bubble Planet doesn’t offer any power-ups to help you, the game has a “skip level” option instead! To get a “skip level” ticket, you will need to shoot at least 2000 bubbles. 2000 is a huge number but if you consistently play the game, it won’t be too hard to get to that amount with time. As an alternative, you could also replay a level to start the game afresh as well. The normal puzzle mode aside, Bubble Planet also features an arcade mode. 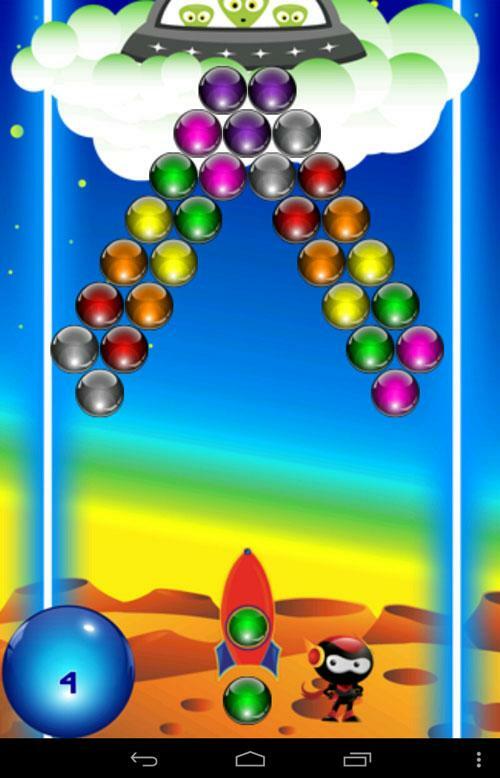 For arcade mode, you’ll be playing an “endless”-version of bubble shooters. How long you can last before the bubbles touches the ground? Well, that’s entirely up to you and your level of bubble shooting skills! There are also over 200 levels available for you to enjoy in Bubble Planet and considering that there aren’t any health or energy system limiting your gaming time, you can literally play until you drop! If you love bubble shooter games, and would like something to play without any restrictions or pesky adverts and cash shops, Bubble Planet is definitely a game you would enjoy. So, do check the game out today on Google Play!